What started as collage compositions about a fashion trend have evolved into deeper explorations of geometric patterns integrated with expressive forms. Each work includes details printed out from my photographs of people wearing striped clothing. In some works I have also used vibrant sections of my abstract alcohol-ink papers. Most recently I have been manipulating my striped print-outs into 3 dimensional forms that play with real and illusionistic space. 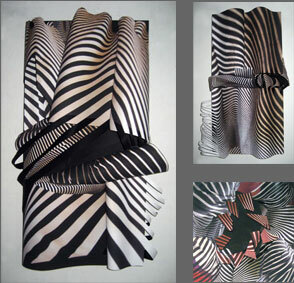 I am interested in how the rigid patterns of parallel lines become undulating and sensual when draped on the human body. In the same way that my earlier work integrated flowing forms within a grid of squares, here too with the stripes, I can explore that intriguing balance of the organic with the geometric, the spontaneous with the controlled. 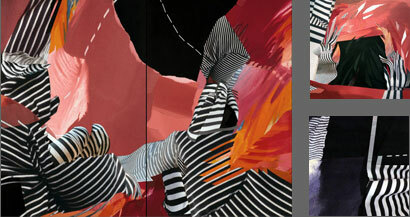 My recent trip to China was the original impetus for these Stripes collages. 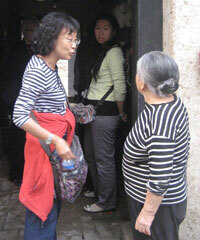 The inspiration came not from the Yangtze River or the Terra-cotta Warriors in Xi'an or other fabulous sights I saw, but rather from a photo I took at a farming village, of our Chinese guide in conversation with a little gray-haired lady. Both were wearing striped blouses. I soon noticed other Chinese wearing clothing with striped patterns: toddlers on a playground, children in a rural school, as well as fashionably dressed women in Beijing, Chengdu and other large cities. I was sure I had identified a new fashion trend soon to go global. When I got back home from my trip, to my great surprise, everywhere I looked I saw Americans in stripes too! I knew that the style hadn't gone around the world during the three weeks I was away. I realized that folks had been wearing those very popular, striped garments all along...I just had not noticed. My heightened awareness while traveling may have triggered something in me, for now I found stripes endlessly fascinating — so fascinating that I had to make art out of them. Seeking more and more striped images, I now photograph anyone I see wearing stripes, getting as close up as they let me.